From James Bond to nerdy Harvard undergraduates trying to develop winning roulette systems, this is a game that's synonymous with drama and excitement. If you want to know how to win, what strategy to use or you just want to put some of the top tips from the pros into practice, first you've got to know the rules and the subtle differences between the three main types of roulette - American roulette, European roulette and French roulette . Looking for the best place to enjoy a game of American Roulette can take some time, but you don't have to look any further as Slots.lv Casino offers the best selection of games around. Before you hit the American roulette tables, it's best to actually know how to play. The action of placing a real cash bet is exactly the same as it is in both European roulette and French roulette. Just click a chip of the value you want to bet and then click on the number you want to bet on the table. If you want to bet odds or evens, or red or black, just click that spot on the table. If you want to bet on groups of numbers, at most online casinos you just hover the chip over the lines that divide the numbers and the numbers included in that group bet will be highlighted. There you go - the rules of American roulette are simple. Roulette systems are always based on math so the first thing to consider are the probabilities - in American roulette these aren't as big as you'd expect from a place where you can buy a 1.9 liter cup of fizzy drink! In American roulette you can bet on the ball landing on any of the 38 slots/numbers, but in European and French roulette there's 37 to bet on. Although at first you might be thinking, 'great that means more choice', it's better for the casino than it is for you. On an American roulette wheel it isn't just labeled from 0-36, there's a double zero too - this raises the casino or houses advantage over you considerably. In fact in European roulette the house edge is 2.7%, in French roulette it's even lower at 1.35%, while in American roulette that edge is a whopping 5.27%. This double zero difference only affects real money bets on groups of numbers though, so if you like betting on black or red or odds or evens it's not going to change anything. The numbers on an American roulette wheel are in a different order than they are on European and French wheels. For example 2 and 28 are on either side of the 0, whereas 26 and 32 are next to 0 in European roulette. In real money American roulette, bets on groups of numbers are called side bets but they're more commonly referred to as pattern bets in European and French roulette where they're also written in French! That being said, in online casinos they'll be written in English too. How to win with betting systems - are they systematically flawed? In a word, yes. Although roulette players have been on the hunt for a winning strategy or system for centuries, no one has ever come up with one that's infallible. The main issue is that each spin of the roulette wheel is entirely independent from the previous one and the next. That means that online roulette systems that use the idea of doubling or increasing your bet after a loss - like the Labouchere or the D'Albert system can lead to massive losses. What if you start off betting $5? After just 5 losses in a row, you'll be wagering $80 on a single spin. There is one American roulette strategy that's worth a try, but it's not a 'how to win roulette and become a millionaire' system similar to the one's you will find all over the internet. Instead it's designed to help you play longer. Developed by Andres Martinez who used to be the Los Angeles Times Editor, it requires you to divide the amount of money you want to spend in one session into 35 chunks and then bet each chunk on the same number for 35 consecutive spins. It's worth noting though that over 35 spins there is a fairly risky 60.68% of winning - but if risks aren't for you, roulette is not going to be your game! 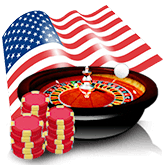 Play American Roulette for free, click here. American Roulette is just as elegant and exciting as the French or European varieties. The only difference is that the American version has a double zero as well as a zero. Although this changes the house edge towards their advantage, the game is just as exciting. In all honesty, you will rarely see an American table sitting empty. It is always a good idea to have a grasp on a game prior to playing with real money. American Roulette is a very fun and easy game to play. For online players, it is as simple as logging on to your favorite online Roulette site, choosing an American wheel, and placing your first bet. Primarily, you just click on the chip you wish to wager, touch it to the bet area on the table, and let her spin. If you bet on the double zero, the payout happens to be the same as if you bet on any single number on the table, which is 35:1. Split it with single zero and should one of the two hit, then you win 18:1. 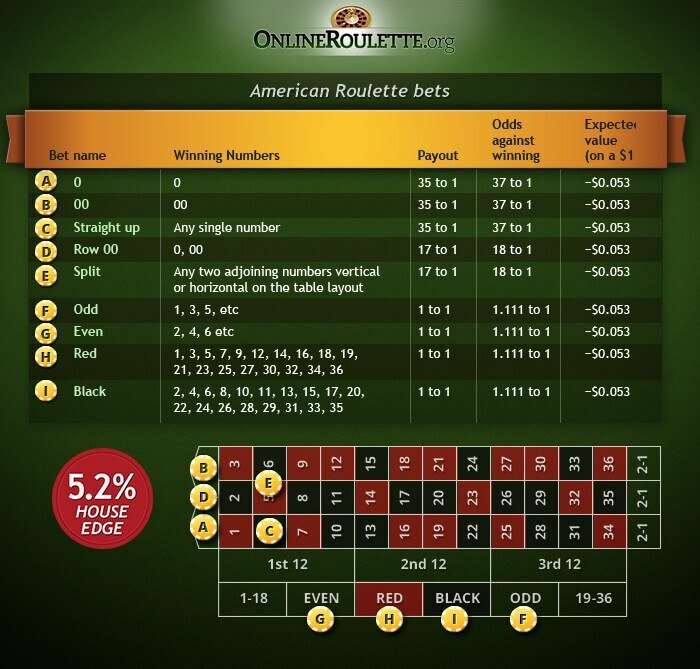 American Roulette is very popular online. The reality is that all Roulette is popular online. Although many people prefer to play on the European Roulette games, American Roulette is highly sought after. Not really, the only difference being the double zero along with a single zero. So instead of 37 numbers on the wheel, there are 38. The house edge goes up to 5.3% rather than the 2.7% found with the European and French variety. This is an age-old question going back to the earliest days of Roulette. In fact, the game was founded on a desire to define probability. The truth is that the best strategy is to wager primarily on outside bets that include odds/evens or black/red numbers. Splurge a little and go with column bets that pay 2:1 too. Although the payout is 1:1, the chances of doubling your bets has a higher probability by way of betting on many numbers at once than wagering the same bet on one or two numbers and hoping for an 18:1 or a 35:1 payout. Playing within your means is the best system or strategy.